Pop down to RD1 or whatever your local agricultural depot is called. Obtain big bucket of “Blackstrap Molasses.” You can use regular standardised molasses, but you need a bit more. If you’re storing it, check it regularly because it ferments naturally and the lids have been known to blow off. You will need 3-4 litres of molasses to make 4 litres of rum at 50% ABV – approximately 100 proof. This will be flammable, and excellent for both de-greasing machinery and killing brain cells. Put the molasses in a sterilized 25 litre container that will take a brewer’s airlock. We use the same ones that we make beer kits in. Add 4 litres of boiling water and stir. This will kill wild yeasts. Top up to 23 litres with cold tap water and drop in a packet of brewer’s yeast. You can instead add a litre of sludge from the last crack at making rum. Most commercial yeasts are grown on molasses, so it’ll ferment like crazy. Fit the lid and wait a couple of weeks. Distil in a pot or wok still (Google for it), remembering to throw away the first 50ml to avoid methanol poisoning, and to always blend your batch together. You’ll need to either add an anti-foaming agent, or only half-fill the still because rum froths rather a lot. 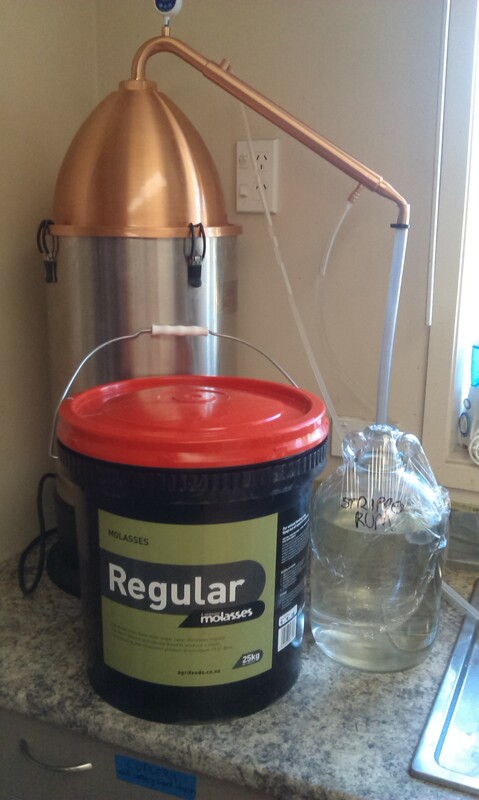 This will give about 4 litres of 40-50% ABV distillate. This is rotgut stuff. Distil it again, keeping the first cut of pure alcohol aside. This concentrates the flavour in the remaining rum and gives you something to make liqueurs with. Cut result with water to suit to your taste. Colour with caramel to emulate commercial “dark” rum, or add oak chips to make it taste like real aged rum.